A guide to Arena of Valor's Skud, the Smasher. Skud is a warrior who knocks enemies into the air with his gigantic arm before sending them flying with his ultimate. Skud is a tanky warrior hero who excels at controlling opponents and bursting down squishy opponents. He is proficient at bullying enemies and can sustain himself for long periods. Skud can be a nightmare in team fights, knocking enemies up and around with his heavy control abilities. Strong Team Fighting Potential – Furious Charge acts both as a great gap closer and initiation ability. His ultimate, Wild Beast Fury, provides further utility for his team as it stuns and pushes opponents it hits. Given that Skud is both tanky and a hard hitter, he is a great option for teams that want to bring the fight to their enemies. High Damage – Skud’s abilities scale well, making his damage output consistent throughout the match. Both when fighting one on one or when starting clashes, he can pummel opponents so long as he manages to get within striking distance. Power Glove, in particular, is great at bursting down squishy enemies, able to knock some out in a single shot. Decent Survivability – Skud’s passive, Anabolic Rage, allows him to restore some health and mana with a specially empowered basic attack. This regeneration makes him deceptively tanky, especially against players who are not familiar with his passive. It additionally gives him a lot of staying power within the lane. Damage Comes in Waves – While Skud is capable of rather fantastic amounts of damage, it is not something that he can keep up consistently. Should enemies manage to dodge his initial attacks, Skud will be unable to properly return any following attacks. Susceptible to Control Abilities – While good at initiating, Skud often struggles when unable to stick to his opponents. If opponents are aware of his ability combo, they can thwart his advances by bombarding him with control abilities. Furthermore, his abilities have relatively short ranges, making it hard for him to regain lost ground. Skud should be sent to the Slayer lane. His durability and high burst damage make him great at harassing opponents and holding his lane. Your job in the lane is to zone out your opponent. Skud is great at bullying opponents with quick, hard trades. Choose Furious Charge at level one. This allows you to rush towards enemies and disable them for a short duration. The disable will leave them open to follow up damage. Level up Power Glove next to further add damage to your normal attacks. It is best to cast Power Glove before going in with Furious Charge due to its short charging time. This is Skud’s primary damaging ability and thereby should be leveled to max first. Finally, level up Wild Beast Fury every time you get a chance. This can be used to set up kills and disrupt the enemy team in team fights, making it a valuable asset to the warrior. Solo Battle: Start charging Power Glove and let the damage build before going in. Rush the enemy with Furious Charge before bursting them with a fully charged Power Glove. This will rip away a huge chunk of their health. Follow up with Wild Beast Fury for additional damage. Careful positioning will ensure that the enemy will be knocked further into dangerous territory. Continue to attack the enemy with basic attacks, striking with your abilities whenever they come off of cooldown. Team Fights: Start the team fight with Furious Charge, trying to hit as many enemy heroes as possible. Position yourself behind the enemy team before casting Wild Beast Fury to push them into your team and spread them out. Next, cast Power Glove and hit the squishiest available target with an empowered normal attack before focusing your assault on them. Escaping the Battle: If your team is losing the fight, cast Furious Charge away from the clash. Power Glove increases Skud’s movement speed when cast, so using it will help you flee from any pursuing enemies. Anabolic Rage – Passive – Every 10 seconds, Skud’s next normal attack deals an additional 20% damage, restores 80 +128 (+4% of his maximum HP) HP and 30 (+3% of his lost mana) mana. Each normal attack also reduces the cooldown of this ability by 1 second. Anabolic Rage gives Skud some survivability in fights and staying power when laning. Be sure to land auto attacks whenever this is up to maximize its effectiveness. Be careful not to hit the attack button while this is available and an enemy is not nearby. Whiffing the attack will waste the charge without restoring Skud’s health or mana. Furious Charge – Skud charges in the target direction, dealing 200/250/300/350/400/450(+ 1.0 AD)ˀ physical damage to enemies in his path and knocking them into the air for 0.5 seconds. Skud stops charging when he runs into an enemy hero. Skud also gains 60/90/120/150/180/210 armor for 3 seconds. This is Skud’s primary initiating ability. Use it any time you want to start a fight. During ganks and team fights, Furious Charge allows him to flank enemies. This disables the targets and leave room for your team to follow up. Furious Charge is particularly useful against heroes who tend to use channeling abilities, since this ability knocks up any enemy it hits. Furious Charge can be used to pass through walls. Power Glove – Skud increases his attack speed by 20% and movement speed by 10% for 5 seconds. The next normal attack deals an additional 120/160/200/240/280/320 (+0.4 AD) physical damage to enemies and reduces their movement speed. The normal attack’s damage is also increased based on time elapsed between the ability use and the normal attack (20% per 5 seconds up to 100%) and cannot critically strike. Charge Power Glove before going into a fight to ensure that you can hit max damage quickly. The attack speed boost provided by Power Glove is a great way to speed up Anabolic Rage’s cooldown. Wild Beast Fury – Skud charges for a brief period, then spins and hits all nearby enemies with his fists, dealing 370/470/570 ((+1.2 AD) physical damage and stunning them for 0.75 second. Also deals additional span style=”color: #ff0000;”>physical damage equal to 15% of the enemy’s current HP and resets the cooldown on Furious Charge. Wild Beast Fury knocks back opponents inside its radius. Use this to your advantage during clashes by moving behind the squishy enemy heroes and cast Wild Beast Fury to knock them towards the team fight. After using Wild Beast Fury, your Furious Charge’s cooldown will be reset. This allows you to use another Furious Charge to further disable a high-priority target during skirmishes or team fights. Skud typically gets tanky items, either HP or armor, to help him soak damage for his team. Take note which items he is stacking and get the counter items to greatly limit his engages and tanking power. Beat Skud to the punch by casting most of your hard crowd control abilites on him even before he decides to engage. This way, he’ll be forced to use his abilities to avoid being shut down. 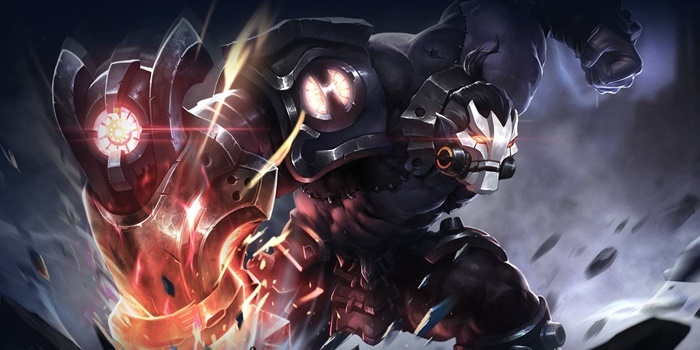 Skud is mostly played as a warrior that hits the frontlines and is tanky enough to survive the enemy’s onslaught. Taking Indomitable, Benovelence, and Mythril can give him additional durability and help him come out top in trades. If you are looking for a Skud that is much more offense based, you can go for Onslaught, Assassinate, and Skewer. Skud usually has equal footing with tanks, especially early game. Most tanks have control abilities that can disrupt Skud’s combos. However, if Skud manages to hit one with his full ability combo, he can punch through even some of the heaviest of defenses. Similar to with tanks, Skud generally does well when fighting with other warriors. Again, the fight will depend on Skud landing his Furious Charge + Power Glove + normal attack combo. That said, his Anabolic Rage allows him to pull off some bonus damage and heal during crucial one on one fights. Skud does well against assassins, as they are usually rather squishy. However, once they get their core items, assassins can give Skud a lot of trouble with their combo damage. A good Skud player will need to use his control abilities to disrupt the assassin’s combos while laying on their own damage. Mages require Skud to get close range. They are generally squishy heroes who deal damage from afar, so Skud will need to use his gap closer to rush in and disable them before he gets burst down or controlled. Similar to with mages, Skud needs to get close to marksmen in order to throw down. After approaching, he can quickly burst them with Power Glove and Wild Beast Fury. That said, once the opposing marksmen get their core items, they can quickly shoot down Skud or kite him to death. Skud is good at separating supports from other heroes and thereby nullifying their effectiveness. He should do so whenever possible, making sure to then turn on the damage dealer rather than focus on the support. I typically try to aim for the towers during team fights, to scoot closer and closer up their lanes. The only way I die is from being ganked, or from people like Valhein with high damage and stuns. PS. I use no armors. Should I add one? For arcana? no, just focus to health. For item? just use the build with highest win-rate. Number never lie.